Edward Blum, seen in February in Washington, D.C., has brought two landmark race relations cases before the Supreme Court this term. An activist with an ability to match the right plaintiff with the right legal challenge has launched two landmark Supreme Court cases that will be decided this month, and verdicts in each could create legal "earthquakes," experts say. Edward Blum (whose last name is pronounced "Bloom") is not an attorney. He's a former stockbroker who now runs the Project on Fair Representation, a non-profit legal organization that is "designed to support litigation that challenges racial and ethnic classifications and preferences in state and federal courts," according to their website. For the past 20 years, Blum has sought out individuals and entities to be the "faces" of breakthrough civil rights cases, and paired them with lawyers who aim to argue the whole way to the top. Their legal fees are paid for by Blum's conservative backers. The two Blum-found "faces" to reach the high court this term: a white student named Abigail Fisher who challenged her rejection from the University of Texas at Austin based on the school's affirmative action policy; and Shelby County, Ala., a Birmingham suburb, which is challenging a section of the 1965 Voting Rights Act, enacted to prevent voting racial discrimination. Blum’s "faces" must meet specific criteria, he says. And it can take him years to find them. "The first hurdle is to seek out plaintiffs who are of, in my opinion, the right philosophy, and have no ax to grind. Sensitive to the fact that there are individuals and organizations who believe that these laws should stay in place," Blum, 61, said. "You cannot seek out people who are bigots or small-minded." As Blum notes, he is not without opponents to his project. "It's unfortunate that someone would want to, and would be so successful at, raising money to help actually perpetuate discrimination in our society, especially going back and trying to undo long hard battles that should be settled law," said Hilary Shelton, NAACP's Washington bureau director and senior vice president for advocacy and policy. Blum fixed his eye on UT-Austin, his own alma mater, after the university started considering race in admissions in 2003, when a Supreme Court ruling declared public schools could do so. UT-Austin has denied Fisher was rejected based on the fact she was white, arguing race is "one of many factors" used in the admissions process. It took Blum more than two years to find his UT-Austin plaintiff: He set up a website in 2006 called UTNotFair.org, but couldn't find the right person. Finally, in 2008, an old friend called and said his daughter Abigail had been rejected from UT-Austin, her top choice. Blum had known the Fishers since before Abigail was born. Fisher's father and sister had both gone to University of Texas; the Sugar Land, Texas, 18-year-old felt the school was in her "family DNA," Blum said. "It's our belief that but for the fact that she's white, she would have been admitted to UT," he said. Besides the fact that Fisher had competitive SAT scores and graduated "nearly in the top ten percent of her class," according to Blum (if she had been in the top 10 percent she would have been automatically admitted to UT when she applied), she stood out to Blum for other reasons. 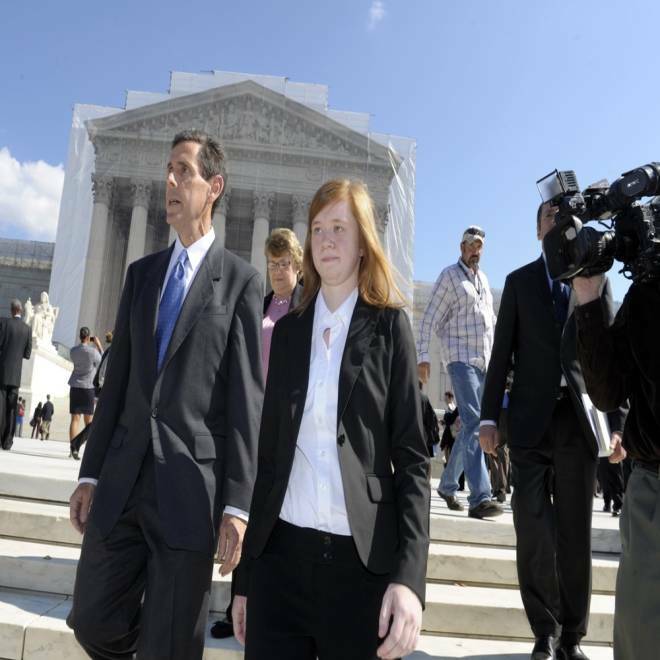 Edward Blum and Abigail Fisher, who was rejected from the University of Texas at Austin and sued over affirmative action after Blum connected her with lawyers, are seen outside the Supreme Court in Washington, D.C., in October 2012. "Abby and her parents are broad-minded, sensitive, non-confrontational, and non-ideological individuals, which is important when litigating issues like this. It's important to find someone of a good heart that understands that there are two sides to this story. Abby understood that," Blum said. Fisher’s case could have a huge impact on public universities' admissions processes. With its decision, the high court could reaffirm its commitment to affirmative action in higher education admissions, ban affirmative action in admissions, or scale it back. Blum does not have a direct connection to Shelby County, but his interest in challenging the Voting Rights Act also stemmed from personal experience. In 1992, he ran for Congress in Houston and, he says, "experienced first-hand the racial gerrymandering that the Texas legislature had accomplished." "I was the Republican nominee running in a 50 percent African-American congressional district. In the course of campaigning, my wife and I knocked on thousands of doors, probably over 20,000 doors, trying to meet the voters and hand out literature," he said. Blum, who now has homes in New York, Maine, and Texas, felt what he witnessed wasn't right. "African-Americans were harvested out and put into a black district that stretched many dozens of miles in one direction. Hispanics in that same neighborhood were harvested and put into a Hispanic neighborhood that stretched dozens of miles in a different direction," he said. "Neighbors that have common concerns were split apart simply because they were a certain color. That is just fundamentally wrong. That was the genesis of my involvement in challenging the courts, racial classifications, and racial preferences by government." Officials in Shelby County, whose original 2010 suit sought to invalidate Section 5 of the 1965 Voting Rights Act --which currently requires nine states, 12 cities and 67 counties to get permission before they make any voting changes -- also appealed to Blum. "They have absolutely no taint of bigotry or discrimination in their individual or collective bodies," he said. "They could be earthquakes in the laws," Tom Goldstein, publisher of the Supreme Court website SCOTUSblog, said of Blum’s two cases. "These are cases that he conceived of from Day 1 all the way from the trial court to the Supreme Court knowing full well that they could go there." About 8,000 cases are filed to the Supreme Court each year. Of those, Goldstein said, only about 500 are "serious" cases; others include petitions from prisoners and other cases that may not have as good of a chance of making the high court cut. The justices scheduled just 75 cases for oral argument this term. While it's not typical for one person to have multiple cases before the court in one term, it's not unheard of. But what makes Blum's situation unusual is that both of his cases could have such far-reaching implications. "These are two landmark cases about the use of race in government decision-making that will potentially bring an end to affirmative action and a central provision of the Voting Rights Act," Goldstein said. 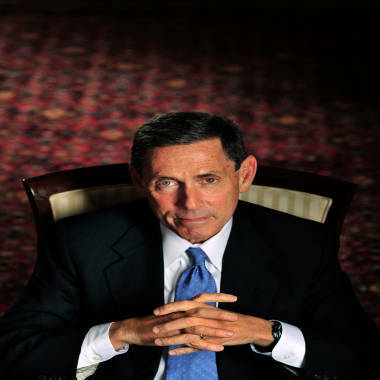 Blum’s work, despite reaching the highest court in the land, has garnered high criticism as well. Section 5 of the Voting Rights Act exists because "you needed an extraordinary protection for an extraordinary form of discrimination," Shelton said. Of Fisher's case, Shelton said: "Access to education determines whether someone is going to live their life in squalor and poverty or opportunity and success. These programs are very, very important as well. We know our country had a very troubling history of discrimination in education." "The goal in all of this is to restore the original colorblind principles to our nation's civil rights laws," Blum said.